A chocolate eclair is a quintessential French pastry. Eclairs, cream puffs, profiteroles and various other desserts are all made from choux dough, or pâte à choux in French. Butter, flour, eggs, and water or cream are cooked in a pot until thick. Using a pastry bag, the dough is piped onto a cookie sheet in the desired shape and baked until golden brown. The pastry is light and airy which makes it ideal for filling. 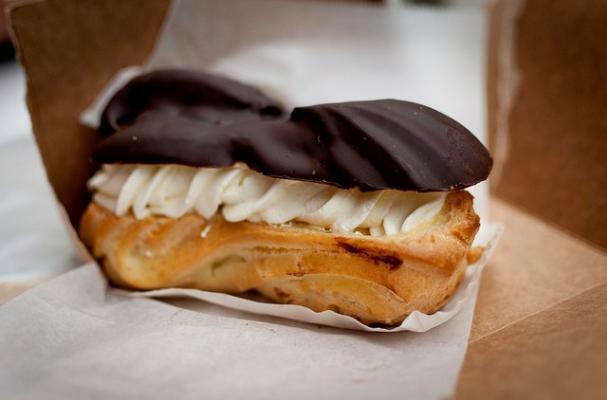 In the case of the eclair, pastry cream and often whipped cream are piped into the center and the top is covered with chocolate. Eclairs are a decadent dessert that are sure to impress whoever lays eyes on them. Preheat oven to 180˚C. Line a baking tray with parchment or a baking mat. Combine water, milk, butter, sugar and salt in a saucepan and bring to a boil over medium heat. Stir in flour quickly and cook over low heat, stirring constantly until mixture pulls away from sides of pan cleanly and forms a ball. Transfer dough into a mixing bowl and using an electric mixer, beat on low speed to cool slightly, about 3 mins. Cover bowl with plastic wrap and chill for at least 30 mins in the fridge. Dough may be stored, covered, for up to 24 hours in the fridge. Remove dough from fridge and fill into a piping bag. From this point on, you can pipe into rounds using a nozzle of your choice or cut a hole of about 1 1/2 cm at the tip of the piping bag and pipe into little logs of about 5 cm in length.... or longer if you want a bigger eclair. Bake in preheated oven for about 20 - 25 mins or until golden brown. Remove from oven and using the tip of a small knife (I used a chopstick), pierce a small hole to allow the steam to escape. This prevents the eclairs from going soggy on the inside. You can also do this step and place it into the oven for another 2 mins to dry it out. Place all ingredients into a saucepan and whisk until evenly combined. Place saucepan over medium heat and bring to a slow boil, stirring continuously. When mixture thickens into a paste, remove from heat. Transfer pastry cream into a clean, dry bowl and cover with plastic wrap to prevent a skin from forming. Allow to cool and then place in fridge until fully chilled. Note: pastry cream will thicken slightly when chilled. Use within 2 days. When chilled, fill pastry cream into piping bag fitted with a tube nozzle and fill eclairs through the hole/slit you have made earlier. Dip or drizzle the top of filled eclairs with chocolate ganache. Heat cream over medium heat in a saucepan until just about boiling. Do not boil. Mix in chocolate pieces and stir until all chocolate has melted. Leave to cool. (Ganache will thicken when cooled). Can be kept in fridge. Remove and stand container in a bowl of warm water to soften before re-using.